Both host and guest confirmed that potential for bilateral economic cooperation has yet to be fully tapped, and agreed to strive for $500 million in two-way trade at an early date, through trade and investment promotion as well as business connectivity activities. Trong lauded Brunei for remaining the fourth largest ASEAN investor in Vietnam, with nearly 200 projects totalling over $1 billion. 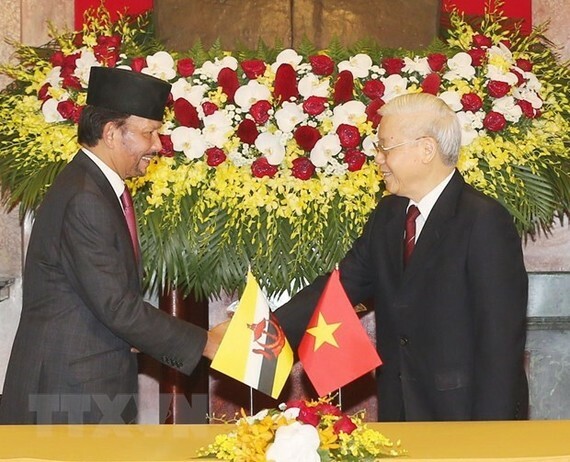 He committed that Vietnam will continue creating favorable conditions for Bruneian enterprises to do business and investment in Vietnam, particularly in important fields such as infrastructure, energy, high-tech agriculture and industry, food processing, tourism, and services. 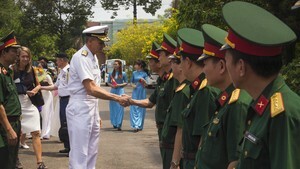 Lauding national defense-security cooperation as a spotlight in bilateral relations over the years, both leaders spoke highly of the effective implementation of the memorandum of understanding (MoU) on defense cooperation in 2005 and the MoU on naval cooperation in 2013. They agreed to work closely together at multilateral defense forums, especially within the ASEAN and ASEAN frameworks, and highlighted the importance of security collaboration amid regional security challenges. Following the talks, they issued a joint declaration on the establishment of the Vietnam-Brunei comprehensive partnership and witnessed the signing of a government-level MoU on the use of a hotline to deal with illegal, unreported and unregulated fishing.